This week for technology we learnt and created a animated digital story with the help of our teacher Miss Anderson. 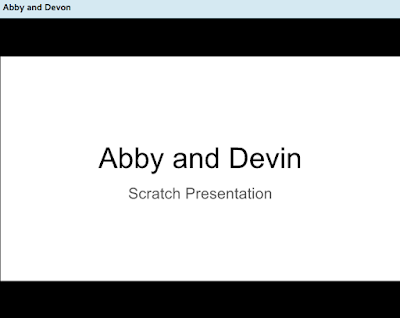 This Abby and Devin Animated story includes instructions and screenshots about how to create an Animated story in scratch. This presentaion will help me create more using these very important tips and instructions. I really enjoyed your presentation. I hope you create more animated stories and keep up the good work!. Great Job on completing you presentation. I'm sure many people would love to use this presentation. Maths - Figure It Out! Hi, I'm Telesia and I am Tongan. I am a Year 7 at Glenbrae School and I am in Kowhai house. My favourite topic is writing & reading, but mostly writing. I like to play all sorts of sports. My favourite colour is blue and I love PIZZA and SUSHI! I have 12 people in my family and I am the 7th oldest. I love watching scary movies and action movies. As I grew up I have really loved Rugby but only play with family. When I grow up I would really want to play Rugby or become a professional Netball Player. Last of all I would also love to focus on my learning as grow up. Visit our class site and class blog!